The Full Effect Company - Linkedin Icon Connect with us on LinkedIn. The Full Effect Company - Twitter Icon Connect with us on Twitter. I had some really interesting conversations and as usual at these events common themes emerged. I guess all of us involved in marketing in the digital age are treading the same path, so it’s good to know you are not the only one struggling with issues and useful to hear how others overcome them. Simon Calvert of Bonmarche (as he was at pains to point out, not the Paris department store, but the UK retailer of the same name) shared his experiences to date in the transformation of their organisation – I say “to date” as a couple of years into his task, it’s still a work in progress – Take note those who believe transformation is anything but a continuous process. Among other things he highlighted, what may be the three key challenges we all face with these projects – breaking down silos, changing mind-sets and gaining the engagement of employees. Anyone involved in transformation will be familiar with these three spectres, but they are all really aspects of a single issue and because of this are remedied with one primary initiative. If you’ve read my articles before you’ll know I believe the reason the vast majority of transformations fail is because of a lack of focus. This causes these projects to meander all over the place, cost more than they should, take too long and waste loads of resources, not to mention cause a great deal of pain. It’s frustrating because all of this is unnecessary. The key to a smooth transformation is brand. I was delighted to hear a few speakers echoing my own views on brands and their role in the transformation and running of businesses in the digital economy. Brands are communities of people with shared values and beliefs. A brand community is built around a promise that all its members understand, believe and contribute to delivering and that’s the focus I am talking about. My brand-led business transformation programme tackles this in two stages. The first involves defining the brand using a dozen coordinates and a brand model format I’ve evolved over the years. The process of developing the brand model itself performs two essential tasks. Firstly it clarifies your brand so that it is easy to explain and secondly it gets those involved in the process – which usually means the organisation’s C-suite and key influencers – on the same page. The second stage is devoted to bringing the rest of your stakeholders on-board, starting with employees, but not forgetting investors, partners, suppliers, distributors and finally customers. There are two more stages after that, but you can check these out at www.thefulleffect.com. For now I want to confine the conversation to these two early stages because it is they that set the scene, not only for your successful, fast and efficient transformation, but in maintaining the competitiveness of your organisation in the digital economy. This second stage is one of comprehensive internal marketing that adopts numerous tools, channels and media to inform, enthuse and equip your stakeholders through on-line instruction and training, to fulfil their role in delivering your brand promise. I usually construct these campaigns around an Intranet and incorporate within that a suite of initiatives I have evolved over the years of engagement on projects like this. Contrary to a common belief, neither transformation nor brand development happen in the boardroom. Business leaders who believe it is their role are often the reason for transformation failure. You have to engage your employees and provide them with the resources to re-engineer the operation of the business. This includes support such as a suitable technology infrastructure and expertise in the shape of specialists in process engineering and digital development to help them bring their ideas to life. Working this way, you will bring about the necessary changes to the structure and processes of your organisation quicker and far more efficiently. This approach has worked for me with companies that range in size from a few hundred to thousands of employees and I’ve also been successful with one that used a number of languages. Small organisations may not require such an elaborate solution as those I have been applying, but the principles always remain the same. There is simply no other way to tackle this and while it does take time to engage your stakeholders and train your employees, businesses that haven’t approach the task this way are proving daily that this simply doesn’t work and wastes loads of time and money. It’s the story of The Hare and the Tortoise, with a few bells on. This wasn’t the only compelling subject that emerged from yesterday’s visit to London. 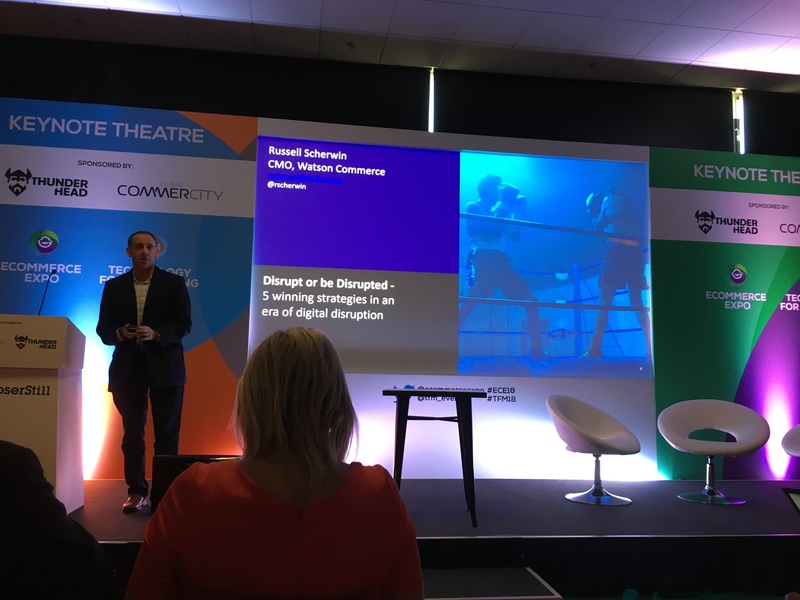 I witnessed a fascinating presentation entitled Disrupt or be Disrupted, by Russell Scherwin of IBM Watson. Fascinating in particular to me because it revealed among other things the progress that Watson is making with artificial intelligence (AI). Some great stuff there. This in turn raised questions regarding the future allocation of personnel. Apparently 55% of time in most businesses is taken up with managing platforms rather than using them to innovate. Russell’s point is that AI is infinitely better at crunching data than people ever will be and we need to get on with the real work. As I have said many times before, “an organisation is only as good as its next big idea” and in the digital economy this is moreso. I’ll pick up on other subjects in other articles over the next week or so, but if you would like to explore any of these subjects with me I’m always open to conversation. Just please drop me a line to schedule. For now I recommend you take time out to consider those three key challenges of transformation and consider what you could incorporate into the internal marketing programme that will transform your organisation. Tell us what your challenges are and what you want to achieve and we’ll work with you to plan your success. When you submit this form you'll also receive our occasional newsletters. © 2019 The Full Effect Company. All rights reservered. | Designed & Developed by Kiss Design Ltd.
Register your interest with no obligation by completing the pre-subscription form below and save £50 on the first series of our Brand-led Business Transformation course when you decide to subscribe on release. Release date: End of November 2018. We’re delighted to share our thoughts and ideas with you. Please complete this sign up and your download will start immediately. When you submit this form you’ll also get our FREE e-mail newsletter.